Jamie T. Ferrara opened his office, Ferrara Law, in March 2014. 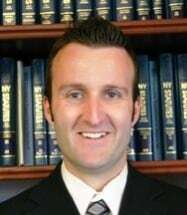 He worked with Blustein, Shapiro, Rich & Barone since April 2011 as an Associate Attorney in the firm's litigation department following a five-year stint an Assistant District Attorney in the Orange County District Attorney's office. While at the Orange County D.A. 's office, Jamie prosecuted an array of criminal activities, including vehicular homicides and assaults, arson, white collar fraud, government theft and animal abuse. Jamie also spent time serving in the Narcotics Unit where he investigated the shadowy undercover world of narcotics and weapons. Jamie handles a spectrum of civil litigation matters, including complex commercial litigation, contract disputes, estate and probate litigation, and landlord-tenant matters. Jamie is an Orange County native, having been born in Goshen and raised in Monroe. In 2001 Jamie earned his Bachelor's Degree in Economics from Siena College, and in 2005 Jamie received his Juris Doctor degree from Albany Law School. Jamie resides in Goshen with his family.